Yeah, here is the bold prediction I guess. I love the Nationals this year. There's still a lot of "ifs" in play, but they underperformed in general last year and are a pretty underrated team already. That's before adding a full year of Strasburg and Zimmerman, and then adding Gio Gonzalez and Edwin Jackson to the rotation. The offense looks to be pretty close to the same team as in 2011, but no one really outperformed expectations and a lot of people stunk (I'm looking at you Jayson Werth). Some steady improvement there and this is a team that breezes to the playoffs. I'm pinning them in the high 80s for wins, but honestly they could be better. The Nationals are 30/1 to win the World Series, and the O/U is at 81.5. I love, love, love both those picks. I'll be in Vegas at the end of April, and if it hasn't moved significantly, I'm all over that. The Phillies are still the team to beat. Their rotation virtually guarantees games in October. The Braves will be solid, if unspectacular, but I could see them making the playoffs. The Marlins would need a lot to break right, but they could make the playoffs as well. The Mets won't make the playoffs but they aren't nearly as bad as anyone is thinking. This will be a very exciting and competitive division. curt loves the nationals this year but i love them more picking them to win the division in what will be a very good 4-team race (excluding my beloved mets) this year. all 4 teams have upside but a lot of holes. the braves have a lot of solid players but they all come with huge limitations or questions to be answered. the pitching staff seems injury prone and jason heyward will need to prove last year was a fluke or that his mechanics have been fixed. his spring has not been promising. the marlins aren't as good as their offseason moves seem to indicate but with a new coach, new stadium, additions of reyes, buerhle, bell, the rebound of hanley, josh johnson and improvements from stanton, @lomomarlins, gaby sanchez, they could be serious contenders. the phillies are the obvious choice here but they have less than a 50% chance of winning this division i think. their offense will be league average at best even with a full season of hunter pence. dominic brown is a disappointment. utley, polanco, howard and rollins are old or injured or old and injured. although there is no better trio of pitchers than halladay, lee and hamels, they won't be any better than they were last year and they lost oswalt who was solid as well. the upside on this team is incredibly limited and due to poor front office decisions over the last couple of years (howard extension, trading lee and then trading for lee) they don't have tons of financial flexibility nor the minor league talent to plug all the holes they will have during the season. sure, they could easily win this division with 93 or so wins, but they'll be in a dogfight all year long. the nationals, however, are all upside. the rotation of strasburg, zimmerman, gonzalez and jackson is one of the best in all of baseball. the bullpen is solid with storen, lidge and owens. the offense is unspectacular but has room for a lot of improvement. a full healthy season from ryan zimmerman will go a long way. michael morse is the real deal (even if he's not as good as he was last year). ramos, desmond, espinosa all provide something and are young. no way jayson werth is as bad as he was last year. 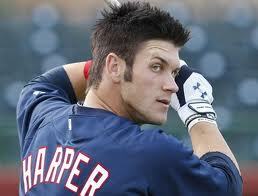 and sooner or later, the best offensive prospect, bryce harper will be on the major league team. finally, davey johnson is a great manager, having gotten the best out of his teams everywhere he's gone before (including guiding the mets from bottom dwellers to the world series in the mid-80s).